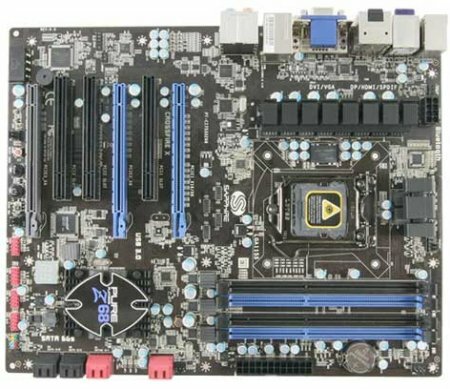 The SAPPHIRE Pure Platinum Z68 is a full ATX sized board that supports the 2nd Generation Intel SandyBridge i3 / i5 / i7 processor family using socket LGA1155. Four dual channel memory sockets are provided, supporting up to 16GB of DDR3 memory with current technology, and capable of supporting up to 32GB when suitable modules become available. There two USB 3.0 ports and four USB 2.0 ports (plus 8 on headers), as well as Gigabit LAN and Bluetooth connectivity with EDR (enhanced data rate). It has four SATA II 3G ports, and two SATA III 6G ports (+ two more on a header) and supports Intel “Rapid Storage” technology as well as RAID 1, 0, 5 and 10. Four Video output options are provided for the on-chip graphics output of the CPU – VGA, DVI, HDMI and DisplayPort - of which any pair can be used simultaneously. The HDMI 1.4a port supports both video and audio. The rear panel has the standard I/O configuration for the on board 8-channel HD 7.1 Audio as well as SPDIF. Add-in graphics support is provided by two PCI-E Gen3 x16 slots, spaced to allow the installation of two dual width graphics cards in CrossFireX. Further expansion is provided by an additional PCI-E x16 slot and three standard PCI slots. Lucid Virtu software is bundled with this board, which provides dynamic switching between the built-in processor graphics and discrete graphics cards. This is ideal for people who want to use high-end, 3D cards for high-resolution gaming and enjoy the power savings of switching to the built-in graphics capabiity of 2nd Generation Intel processors for 2D or media applications. The Z68 chipset supports performance tuning by allowing separate adjustment of clock speeds, multipliers and voltages, ideal for overclocking. All these changes can be made in the BIOS of the SAPPHIRE Pure Platinum Z68. The board has a Dual BIOS, allowing for experimentation and updates, and for the hard-core enthusiast, voltage test pads have been brought out to the edge of the board for the critical voltages on the CPU and memory circuits. Other user friendly features include digital debug display and a push button reset for the BIOS, as well as start and system reset buttons. Hardware monitoring tools and the SAPPHIRE proprietary Mainboard TriXX software allow users to review and adjust a range of system parameters while optimising performance of the CPU. The build quality of the SAPPHIRE Pure Platinum Z68 is high. It has a black multilayer PCB, and uses high quality gold plated connectors for USB 3.0 and LAN. It incorporates many of the high end features associated with the SAPPHIRE brand, such as the use of high reliability solid capacitors throughout. The multi-phase voltage regulation circuitry, 6 + 2 phase for the CPU and 3 phase for the memory modules, incorporates the patented SAPPHIRE Diamond Black chokes with coolers that have featured on SAPPHIRE’s high end graphics cards, and the chipset is passively cooled contributing to reliability as there are no moving parts to fail.